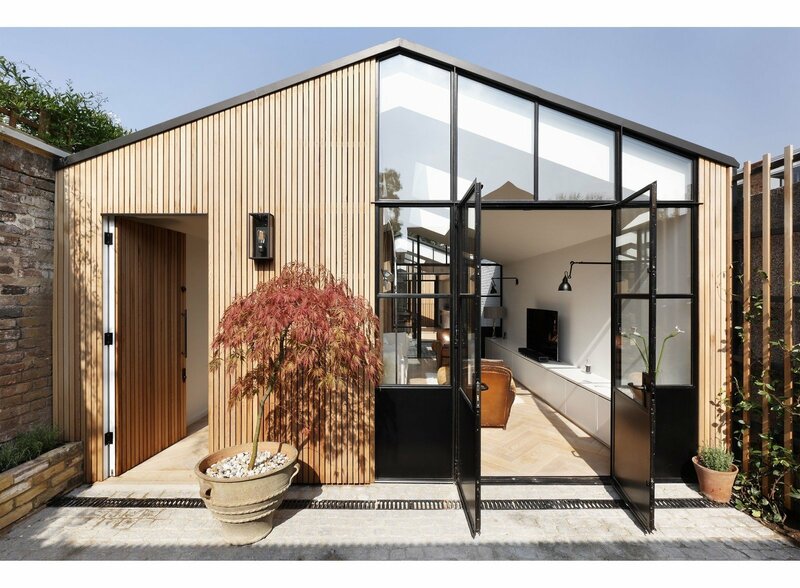 The Courtyard House is a minimal residence located in London, United Kingdom, designed by De Rosee Sa. On the site of a former garage located in an awkward space between rear terraced gardens and a row of 16 west-London garages. The owners of the site live across the road and originally bought it to prevent it from being developed. Seeing an opportunity, our clients have decided to develop the land themselves. Planning restrictions only allow a single story above ground, so we proposed a half basement to meet the client’s brief for a two-bedroom house. Windows in the the boundary wall are not possible. In response to this, our design includes two atria that bring daylight into courtyard spaces and roof lights throughout to draw light into the house. The house’s interior spaces will give onto the new courtyards through steel and glass ‘crittal’ style doors. Western red cedar clads one of the courtyard walls and passes inside to clad the small rooms.